Unlike the image often portrayed by Hollywood the backbone of the German Army was the largely horse-drawn infantry division. Although these formations may now seem very primitive compared to the fully mechanised British, Canadian and American forces this criticism cannot be made of German equipment. 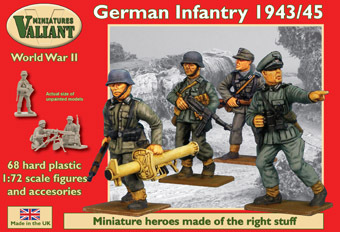 The models in this box include the excellent MG 42 machine gun (which remained in regular service 50 years after the war), two varieties of anti-tank rocket launcher (the bazooka like 'Panzershrecke' and the one-shot 'Panzerfaust') and the world's first mass produced assault rifle (the MP 44). In 1939 three infantry regiments formed the core of an infantry division and each of these had an establishment of three battalions. However, by 1943 manpower shortages meant that the strength or each infantry regiment was reduced to two battalions (supported by an anti-tank company and infantry gun company). Each division also had various supporting units including an artillery regiment, a reconnaissance (fusilier) battalion mounted on bicycles, and an anti-tank (equipped with assault guns and tank destroyers) and an engineer battalion. Material shortages had also forced economies in uniform manufacturing and the famous jackboot of the blitzkrieg era had been phased out and replaced by the ankle boot and canvas gaiter represented by our figures. The best eCommerce software by ShopFactory powers P1377. All-in one eCommerce and shopping cart software.